Citation Information: J Clin Invest. 2019. https://doi.org/10.1172/JCI98929. The impact of food antigens on intestinal homeostasis and immune function is poorly understood. Here, we explored the impact of dietary antigens on the phenotype and fate of intestinal T cells. Physiological uptake of dietary proteins generated a highly activated CD44+Helios+CD4+ T cell population predominantly in Peyer patches. These cells are distinct from regulatory T cells and develop independently of the microbiota. Alimentation with a protein-free, elemental diet led to an atrophic small intestine with low numbers of activated T cells, including Tfh cells and decreased amounts of intestinal IgA and IL-10. Food-activated CD44+Helios+CD4+ T cells in the Peyer patches are controlled by the immune checkpoint molecule PD-1. Blocking the PD-1 pathway rescued these T cells from apoptosis and triggered proinflammatory cytokine production, which in IL-10–deficient mice was associated with intestinal inflammation. In support of these findings, our study of patients with Crohn’s disease revealed significantly reduced frequencies of apoptotic CD4+ T cells in Peyer patches as compared with healthy controls. These results suggest that apoptosis of diet-activated T cells is a hallmark of the healthy intestine. Citation Information: J Clin Invest. 2019. https://doi.org/10.1172/JCI98554. Citation Information: J Clin Invest. 2019. https://doi.org/10.1172/JCI123233. In the stomach, chronic inflammation causes metaplasia and creates a favorable environment for the evolution of gastric cancer. Glucocorticoids are steroid hormones that repress proinflammatory stimuli but their role in the stomach is unknown. In this study, we show that endogenous glucocorticoids are required to maintain gastric homeostasis. Removal of circulating glucocorticoids in mice by adrenalectomy resulted in the rapid onset of spontaneous gastric inflammation, oxyntic atrophy, and spasmolytic polypeptide-expressing metaplasia (SPEM), a precursor of gastric cancer. SPEM and oxyntic atrophy occurred independently of lymphocytes. However, depletion of monocytes and macrophages by clodronate treatment or inhibition of gastric monocyte infiltration using the Cx3cr1 knockout mouse model prevented SPEM development. Our results highlight the requirement for endogenous glucocorticoid signaling within the stomach to prevent spontaneous gastric inflammation and metaplasia and suggest that glucocorticoid deficiency may lead to gastric cancer development. Citation Information: J Clin Invest. 2019. https://doi.org/10.1172/JCI122085. Neutrophil (PMN) infiltration of the intestinal mucosa is a hallmark of tissue injury associated with inflammatory bowel diseases (IBDs). The pathological effects of PMNs are largely attributed to the release of soluble mediators and reactive oxygen species (ROS). We identified what we believe is a new, ROS-independent mechanism whereby activated tissue-infiltrating PMNs release microparticles armed with proinflammatory microRNAs (miR-23a and miR-155). Using IBD clinical samples, and in vitro and in vivo injury models, we show that PMN-derived miR-23a and miR-155 promote accumulation of double-strand breaks (DSBs) by inducing lamin B1–dependent replication fork collapse and inhibition of homologous recombination (HR) by targeting HR-regulator RAD51. DSB accumulation in injured epithelium led to impaired colonic healing and genomic instability. Targeted inhibition of miR-23a and miR-155 in cultured intestinal epithelial cells and in acutely injured mucosa decreased the detrimental effects of PMNs and enhanced tissue healing responses, suggesting that this approach can be used in therapies aimed at resolution of inflammation, in wound healing, and potentially to prevent neoplasia. Citation Information: J Clin Invest. 2018. https://doi.org/10.1172/JCI122478. The adenomatous polyposis coli (APC) gene plays a pivotal role in the pathogenesis of colorectal carcinoma (CRC), but remains a challenge for drug development. Long non-coding RNAs (lncRNAs) are invaluable in identifying cancer pathologies, and providing therapeutic options for cancer patients. Here, we identified a lncRNA (lncRNA-APC1) activated by APC through lncRNA microarray screening, and examined its expression among a large cohort of CRC tissues. A decrease in lncRNA-APC1 expression was positively associated with lymph node and/or distant metastasis, a more advanced clinical stage, as well as a poor prognosis of CRC patients. Additionally, APC can enhance lncRNA-APC1 expression by suppressing the enrichment of PPARα on the lncRNA-APC1 promoter. Furthermore, enforced lncRNA-APC1 expression was sufficient to inhibit CRC cell growth, metastasis and tumor angiogenesis by suppressing exosome production through directly binding Rab5b mRNA and reducing its stability. Importantly, exosomes derived from lncRNA-APC1-silenced CRC cells promoted angiogenesis by activating the MAPK pathway in endothelial cells, and moreover, exosomal Wnt1 largely enhanced CRC cell proliferation and migration through non-canonicial Wnt signaling. Collectively, lncRNA-APC1 is a critical lncRNA regulated by APC in the pathogenesis of CRC. Our findings suggest an APC-regulated lncRNA-APC1 program as an exploitable therapeutic maneuver for CRC patients. Citation Information: J Clin Invest. 2018. https://doi.org/10.1172/JCI122359. Iron-related disorders are among the most prevalent diseases worldwide. Systemic iron homeostasis requires hepcidin, a hepatic-derived hormone that controls iron mobilization through its molecular target, ferroportin (FPN), the only known mammalian iron exporter. This pathway is perturbed in diseases that cause iron overload. Additionally, intestinal HIF-2α is essential for the local absorptive response to systemic iron deficiency and iron overload. Our data demonstrate a hetero-tissue crosstalk mechanism, where liver hepcidin regulated intestinal HIF-2α in iron deficiency, anemia, and iron overload. We show that FPN controlled cell autonomous iron efflux to regulate the activity of iron-dependent, intestinal prolyl hydroxylase domain enzymes to stabilize HIF-2α. Pharmacological blockade of HIF-2α using a clinically relevant and highly specific inhibitor successfully treated iron overload in a mouse model. These findings demonstrate a molecular link between liver hepcidin and intestinal HIF-2α that controls physiological iron uptake and drives iron hyperabsorption during iron overload. Citation Information: J Clin Invest. 2018. https://doi.org/10.1172/JCI97912. Dysregulated intestinal epithelial apoptosis initiates gut injury, alters the intestinal barrier, and can facilitate bacterial translocation leading to a systemic inflammatory response syndrome (SIRS) and/or multi-organ dysfunction syndrome (MODS). A variety of gastrointestinal disorders, including inflammatory bowel disease, have been linked to intestinal apoptosis. Similarly, intestinal hyperpermeability and gut failure occur in critically ill patients, putting the gut at the center of SIRS pathology. Regulation of apoptosis and immune-modulatory functions have been ascribed to Thirty-eight-negative kinase 1 (TNK1), whose activity is regulated merely by expression. 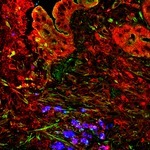 We investigated the effect of TNK1 on intestinal integrity and its role in MODS. TNK1 expression induced crypt-specific apoptosis, leading to bacterial translocation, subsequent septic shock, and early death. Mechanistically, TNK1 expression in vivo resulted in STAT3 phosphorylation, nuclear translocation of p65, and release of IL-6 and TNF-α. A TNF-α neutralizing antibody partially blocked development of intestinal damage. Conversely, gut-specific deletion of TNK1 protected the intestinal mucosa from experimental colitis and prevented cytokine release in the gut. Finally, TNK1 was found to be deregulated in the gut in murine and porcine trauma models and human inflammatory bowel disease. Thus, TNK1 might be a target during MODS to prevent damage in several organs, notably the gut. Citation Information: J Clin Invest. 2018. https://doi.org/10.1172/JCI99806. Lysyl-tRNA synthetase (KRS) functions canonically in cytosolic translational processes. However, KRS is highly expressed in colon cancer, and localizes to distinct cellular compartments upon phosphorylations (i.e., the plasma membranes after T52-phosphorylation and the nucleus after S207-phosphorylation), leading to probably alternative non-canonical functions. It is unknown how other subcellular KRSs crosstalk with environmental cues during cancer progression. Here, we demonstrate that the KRS-dependent metastatic behavior of colon cancer spheroids within three-dimensional gels requires communication between cellular molecules and extracellular soluble factors and neighboring cells. Membranous and nuclear KRS were found to participate in invasive cell dissemination of colon cancer spheroids in three dimensional gels. Cancer spheroids secreted GAS6 via a KRS-dependent mechanism and caused the M2 polarization of macrophages, which activated the neighboring cells via secretion of FGF2/GROα/M-CSF to promote cancer dissemination under environmental remodeling via fibroblast-mediated laminins production. Analyses of tissues from clinical colon cancer patients and Krs–/+ animal models for cancer metastasis supported the roles of KRS, GAS6, and M2 macrophages in KRS-dependent positive feedback between tumors and environmental factors. Altogether, KRS in colon cancer cells remodels the microenvironment to promote metastasis, which can thus be therapeutically targeted at these bidirectional KRS-dependent communications of cancer spheroids with environmental cues.